McQ, the late Alexander McQueen’s lower priced line, showed its first runway show ever this season. 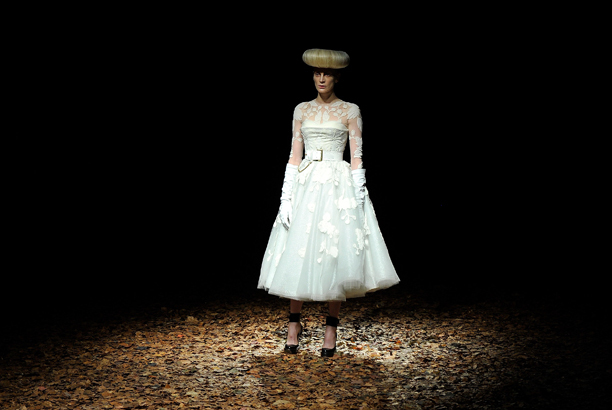 Sarah Burton, McQ’s Creative Director, presented a beautiful collection– an homage to the late McQueen. The show is likely to drum up buzz — the McQ’s first flagship shop in London is opening in a few weeks. After watching the show, it was hard to imagine that this was a lower priced line given the fine fabrications and impeccable tailoring. The themes of the show were romance, dark glamour, and autumn, and the runway was a carpet of dead leaves. The show started with military coats in olive green and khaki, followed by wine and black colored dramatic dresses embellished with leafy embroidery. The looks captured the shack in the woods theme to a tee. The showstoppers were the nipped-waist cocktail dresses –worthy of any red carpet– the plaid dress inset with black lace, and the hairdos which looked liked bagels on top of the model’s heads. I love the kitschiness of it all. And the spoiler alert of the night? If there ever was a fashion moment during London Fashion week, it was the finale of the show. Kristen McMenamy, a legendary model, dressed in a full white tulle dress, stepped into a forest of trees. There was a small barn built alongside the trees, and all of a sudden the lights go out all but a neon light. She pulled a rope, flipped the switch, and the set turned into a disco! This was truly a highlight of power and energy of London fashion week and I would have loved to see the drama unfold. I imagine that this season’s collection will draw attention to the much needed diffusion line.